What: Usually accompanied by a greasy burger or sloppy sandwich, French fries are often one part of a balanced hangover cure. But at New York's Calexico, they're the platform for something else entirely. Chile-cilantro fries are smothered with cheese sauce, black beans, pico de gallo, caramelized onions, and, best of all, a pile of juicy carne asada. Guacamole on top seals the deal. 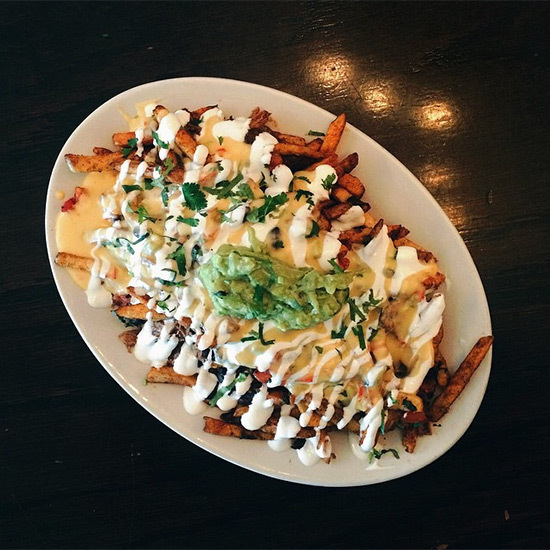 Part nachos, part poutine and all entirely satisfying. Wash it down with: A margarita is the logical accompaniment, but we’d rather opt for an original creation like the "Tequila Mockingbird"—basil-infused tequila, watermelon, jalapeño, agave, and lime.